For the implementation of the safety management system, the organization is to establish safe working procedures and safe work practices so that all the works are carried out safely and the risks of injury to work men and damage of equipment and property are eliminated or minimized. The safe working procedures and safe work practices are to be established meeting the requirements of the Factories Act as well as meeting the requirements of the work processes. Safe working procedures and safe work practices are established in the organization for addressing significant hazards or for dealing with circumstances that may present other significant risks/liabilities for the organization. They reflect the approach of the organization for controlling safety hazards. Safe working procedure is a step by step process that guides a work man through a task from start to finish in a chronological order. Safe work procedures are designed to reduce the risk by minimizing potential exposure for performing a work safely from beginning to end. Safe work practice is a set of guidelines established to help work men to perform a task which may not require a step by step procedure. Safe work practices are generally written methods outlining how to perform a task with minimum risk to people, equipment, materials, environment, and processes. Safe working procedures and safe work practices tells work men how to perform a specific task so as to mitigate hazards that have been identified through the hazard identification process. They are guideline documents for the maintenance of safety in the organization. The extent of the application of the safe working procedures and safe work practices depends on the safety policy of the organization, the nature of the activities in the organization, and complexity of the operations. Safe working procedures and safe work practices usually have seven components namely (i) purpose, (ii) scope, (iii) responsibility, (iv) description of the process or guidelines, (v) reference, (vi) enclosures, (vii) forms and records. They are the internal documents of the organization. Documents control procedures are normally followed to keep these documents up to date. Safe working procedures and safe work practices are written documents and are written by those people who have the knowledge, skill and experience of the work place. They are used to train and guide work men for performing their job safely. They help eliminate or minimize the risks of carrying out the hazardous tasks. Safe working procedures and safe work practices cover specific safety activities. They are normally for all hazardous tasks performed at the work place. They are directions on how work is to be carried out safely. They identify hazards and clarify what must be done to eliminate or minimize risks. All tasks may not need a written safe working procedures or safe work practices. In such case it is sufficient to address safety issues verbally when training workers. The decision regarding the need of a written procedure normally depend upon (i) severity and consequences in case of an accident, (ii) frequency of the task or the job, and (iii) complex nature of the task. In general, written safe working procedures and safe work practices are needed for (i) hazardous tasks, (ii) complicated tasks, so that important steps are not missed, (iii) frequently performed tasks, (iv) less routine tasks, in case work men need reminders about the hazards and how to control the risks. Ideally the organization must prepare written safe working procedures or safe work practices for all identified hazards. These safe working procedures and safe work practices are to be readily available at the locations where the tasks are being performed or next to the equipment used for the tasks. Through the safe working procedures and safe work practices work men are made responsible for working safely. Safe working procedures and safe work practices are to include all the statutory requirements and are to list all the personal protective equipment(PPE) which are needed for carrying out the task. The procedures are to include when PPEs must be used, and where work man can find them. 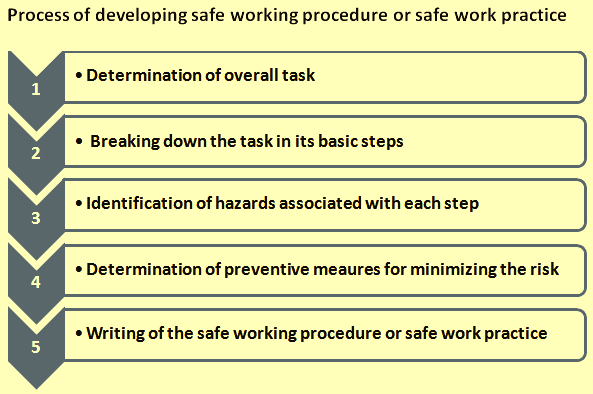 The process of developing a safe working procedure or a safe work practice for a hazardous task (Fig 1) includes five steps namely (i) to determine the overall task that requires the safe working procedure or safe work practice, (ii) breaking down the task into its basic steps, (iii) to identify the hazards associated with each step, (iv) to determine preventive measures for eliminating or minimizing the risks to work men from these hazards, (v) to write the safe working procedure or safe work practice consisting of the list of actions that work men must do when performing the task. The following steps are to be followed to ensure sound safe working procedures and safe work practices are developed. Though safe working procedures and safe work practices are developed by those persons who have the knowledge/understanding of the task/activity, yet it is important to observe the task/activity being performed the preferred way to ensure safest method is documented. The statutory requirements are to be reviewed since some task/activities are governed by the statutory requirements. These must be considered when developing safe working procedures or safe work practices for ensuring that the statutory requirements are included. If the task/activity uses any hazardous substance/s or dangerous good/s then safe working procedures and safe work practices must refer to the material safety data sheet/s the (MSDS) for each hazardous substance or dangerous good. The sequence of basic steps that make up the task/activity are to be part of safe working procedures and safe work practices. Potential hazards of each step are to be included. Also to be included in each step are identification of activities that may have potential to cause injury or disease (to those doing the work or to anyone else nearby), damage to the environment, property, plant or equipment. Safe working procedures and safe work practices are to identify ways of eliminating and controlling the hazards. For each identified hazard, the measures are to be listed that need to be put in place to eliminate or control any likely risk occurring. Safe working procedures and safe work practices are to be vetted by the work men performing the task and based on their observations they are to be adjusted/revised as necessary. Safe working procedures and safe work practices are to be approved by the approving authority before they are issued and used. Implementation of safe working procedures and safe work practices are to be monitored to ensure the documented process is being followed. The following are the important issues in the development of safe working procedures and safe work practices. Work men who regularly perform the work are to be involved in the preparation since they are the people who knows best about all the possible hazards. These workmen provide the best information and hence safety procedures and work practices will reflect the ‘real life’ at the work place. All the steps are to be put in the correct sequence while writing safe working procedures and safe work practices. The steps are to be properly numbered. All the hazards associated with each step are to be identified. The hazards are to be evaluated based on severity and frequency. The controls are to be established for the hazards recognized and evaluated. In the safe working procedures and safe work practices, the vocabulary used is to be appropriate to the work men. Short and clear sentences are to be used in the writing of the safe working procedures and safe work practices. It is to be ensured that the instructions are accurate. The terminology used in the writing of the safe working procedures and safe work practices is to be consistent. Only ‘active’ verbs are to be used for instructions. A consistent formatting (e.g. headings and font size) is to be used. Safe working procedures and safe work practices are to be those documents which are easy to understand for the workers so that they can implement it willingly. An important point to remember is to keep the actions in their correct sequence. Any action which is out of order may invalidate the analysis by missing potential hazards or by introducing hazards which do not actually exist. For the implementation of safe working procedures and safe work practices the following actions are needed. A communication plan for informing the work men. A training plan which include (i) identification of work men who needs training, (ii) the quantum of training which is needed, and (iii) estimation of time which is required for training. An orientation plan for (i) new work men, (ii) for those work men who have changed the job, and (iii) for those work men who are returning to the work place after an extended absence. Safe working procedures and safe work practices at the work place have the following benefits. They provide standards for how work is to be carried out. They have a positive effect on quality, efficiency, and productivity. They prevent injury and illness by controlling potential hazards. They help the organization in fulfilling the statutory requirements. They inculcate a sense of discipline and responsibility amongst the workmen. They are a means by which the management and the workmen practice due diligence. They provide standards for (i) training and orientation of workmen, (ii) review of the work processes with the work men, (iii) completing safely the work activities, and (iv) evaluating the work performance.